Wayne is an expert in Wi-Fi standards and regularly consults on patents in this and related fields. He has gathered 20+ years of knowledge, saved across various documents and locations, and relies on his memory to highlight patents. 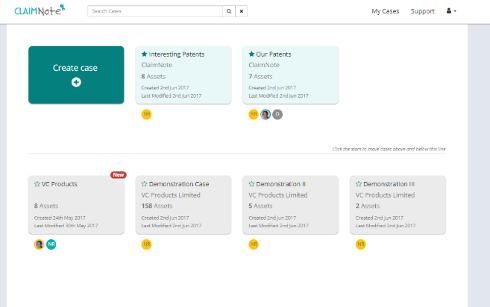 ClaimNote has enabled Wayne to import his previously gathered patent data and analysis and organise it into one place. Now, he can find information with ease. Wayne can search quickly and efficiently through all previous cases for information on a patent, a term, or a topic. Using the box, Wayne can rapidly identify whether he has previously reviewed or analysed a patent. If he has, he can easily navigate to that analysis. Francesca is a patent litigation lawyer who works across several industries and may be involved with multiple cases at one time. She works in a busy law firm, and can get frustrated with multiple individual systems. Collaborating with colleagues can lead to problems with version control as the most up-to-date information is not always circulated to those who actually require it. Through the collaboration feature, Francesca invites colleagues to collaborate and contribute to her cases. She chooses the access level for each collaborator. Having everyone working in the same place means that everyone is always returns to the most up-to-date information. 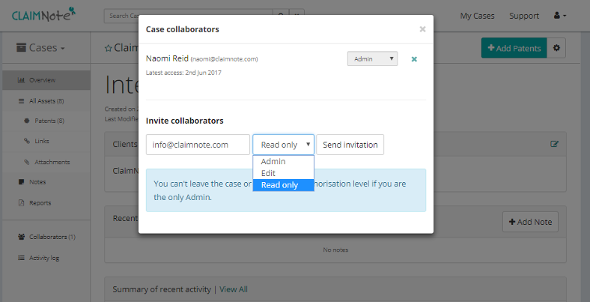 Using ClaimNote not only helps Francesca to speed up information retrieval time, but also means that she can now transition easily between projects and cases as her work is held in one place. Marking current cases as Favourites means that she can access them instantly. Hermless Corporation, a research and development company, has a large and varied patent portfolio. 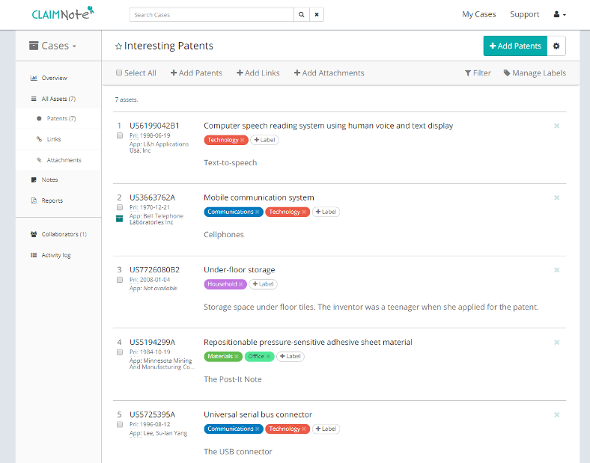 The company currently uses multiple documents and spreadsheets to keep track of its patents. This means that analyses can be in different places, information can get lost, and few checks are in place to confirm that all the information in a document is correct. Patent digits can be entered incorrectly, priority dates may be wrong, and links and titles do not always match. 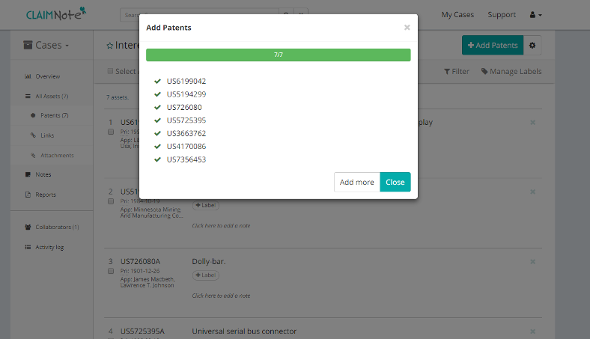 ClaimNote’s automatic patent import system is incredibly simple to use. 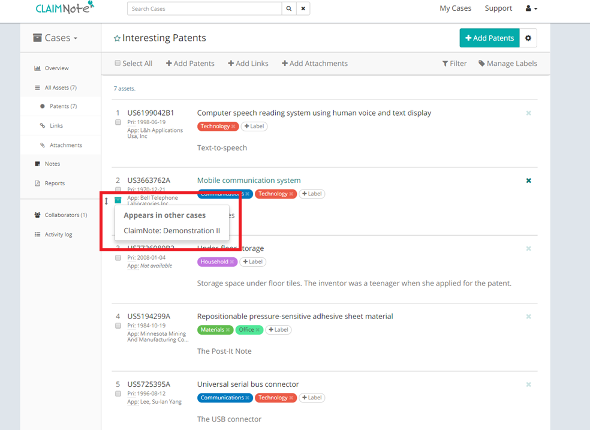 A list of patents can be copied and pasted, and ClaimNote automatically imports them. The import includes the patent number, priority date, original assignee, title and a link to the patent in Google patents. Hermless Corporation is now confident that this essential information is always correct. The ability to add unlimited labels to a patent means that all collaborators are kept up-to-date with developments and changes to the patent. Changes might relate to analysis, sales or licensing of patents.